NASA's nanotechnology-based biosensor is able to detect trace amounts of specific bacteria, viruses and parasites. "The biosensor makes use of ultra-sensitive carbon nanotubes which can detect biohazards at very low levels," explained Meyya Meyyappan, chief scientist for exploration technology and former director of the Center for Nanotechnology at Ames. "When biohazards are present, the biosensor generates an electrical signal, which is used to determine the presence and concentration levels of specific micro-organisms in the sample. 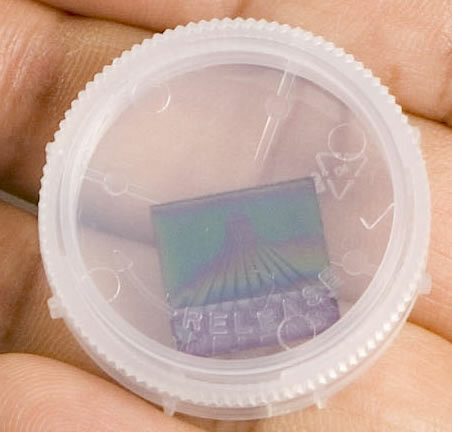 Because of their tiny size, millions of nanotubes can fit on a single biosensor chip." Under a Reimbursable Space Act Agreement, NASA and Early Warning jointly will develop biosensor enhancements. This is yet another technology developed for the space program that has returned to Earth for civilian use. The device will be used to cheaply perform frequent and comprehensive testing for pathogens and infectious diseases in the U.S. and around the world, which is the best way to prevent outbreaks of water-borne disease. Science fiction readers have been looking forward to this sort of highly portable and easy to use biosensor; see the Boink biosensor from The Cobra Event (Richard Preston, 1997) and the WAGD Germ Detector from Quantico (Greg Bear, 2007) for sfnal references. From NASA Nanotechnology-Based Biosensor Helps Detect Biohazards (NASA press release).